A month ago, on Monday, April 11, 2016, a 3-judge panel of the 10th U.S. Circuit Court of Appeals had rendered the Brown v. Buhman decision as “moot.” Without even considering the merits of the case, but instead being based on the Utah prosecutors later proclaiming that they would not really go after the Brown family for polygamy, the three judges decided that the case was “moot” because the Browns supposedly had no more legal “standing” to even bring this to court. Immediately afterward, the Brown family requested a re-hearing by all of the judges in the entire Tenth Circuit Court of Appeals. On Friday, May 13, 2016, the Tenth Circuit turned down that “en banc” request. In opening that “order,” the decision additionally noted the following. As no member of the original panel or the en banc court requested that a poll be called, the petition for en banc review is denied. This latest text of the May 13 decision was mostly the same as that of the earlier April 11 decision (see: 2016-04-11 Tenth Circuit reverses Brown v Buhman. However, at end of the last word of the last paragraph of the last section before the Conclusion, the Court added one new additional footnote, Footnote #27. The last paragraph that added that Footnote #27 declared the following. The text for that one additional Footnote #27 explained the following. 27 As explained above, the Browns’ move to Nevada eventually also rendered this case moot. Whether or not this basis for mootness took effect before commencement of this appeal, Mr. Buhman’s implementation of the UCAO Policy was independently sufficient to extinguish any live case or controversy as of May 2012, a year and a half before the district court granted summary judgment to the Browns and over two years before entry of final judgment. Because this case became moot “prior to final adjudication,” Rio Grande Silvery Minnow, 601 F.3d at 1128 n.19, vacatur and dismissal without prejudice are appropriate. With that “explained” in the additional Footnote #27, the decision concluded with the following. Assuming the Browns had standing to file suit in July 2011, this case became moot when Mr. Buhman announced the UCAO Policy in May 2012. That policy eliminated any credible threat that the Browns will be prosecuted. We therefore remand to the district court with instructions to vacate its judgment and dismiss this suit without prejudice. As FOX 13 reported, Renowned Constitutional law professor and the attorney for the Brown family, Jonathan Turley, wrote the following email response. 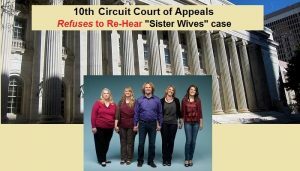 So with that, the “Sister Wives” polygamy case now moves up to the final court of last resort, SCOTUS (Supreme Court of the United States).